"Whispering Waters" #208 is an adorable two bedroom, two bath cabin located in Pigeon Forge on Cove Creek. You can choose to take a break and relax... VIEW NOW. If you happen to experience a rainy day during your summer vacation in the Smokies, this is the perfect opportunity for a swim in your private indoor pool! While the rain falls outside of your cabin, you can splash around in the pool having a blast for hours! You might be having so much fun swimming in the pool that you may not even notice when the sun is shining again to resume your outdoor activities! During the peak summer temperatures, there is nothing more refreshing than taking a dip in our Gatlinburg cabins with swimming pools! After a strenuous hike through the Great Smoky Mountains National Park or an afternoon exploring downtown Gatlinburg, you can look forward to cooling off in the indoor pool at your cabin. The pool is also a great way to wind down at night after a busy day in the Smokies! When you spend the day at a water park or an outdoor public pool, you constantly have to worry about applying sunscreen to avoid a burn. The cabins with a pool from Acorn Cabin Rentals are located indoors so that you never have to be concerned about a sunburn! If you have children in your family, you can relax knowing that they will be protected from the sun and can spend all the time they want in the pool! One of the problems with going to a pool on a hot summer’s day is that everyone else wants to visit the pool too! This can result in long lines at a water park or crowded conditions at a public pool facility. When you stay in our Gatlinburg cabins with swimming pools, the pool is for your private use only so you don’t have to worry about sharing it with anyone else! The swimming pool in your cabin from Acorn Cabin Rentals is just one amenity of many that we offer to our guests! While staying with us, you can enjoy a fully equipped kitchen where you can prepare a delicious meal after a few hours in the pool. Our cabins also feature such fantastic amenities as hot tubs, game rooms, theater rooms and more! Of course, every cabin is situated in a scenic location and is just minutes from all the attractions, restaurants and shops in downtown Gatlinburg! 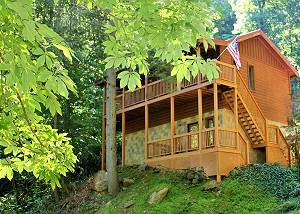 Check out all of our Gatlinburg cabins with swimming pools today to plan your summer vacation to the Great Smoky Mountains! We hope to see you soon at Acorn Cabin Rentals!